Copaiba essential oil is an incredible oil that is derived from the resin of the copaiba tree. While copaiba doesn't contain psychoactive cannabinoids, the main component caryophyllene may be neuroprotective and have cardiovascular and immune benefits. It’s also a powerful antioxidant that promotes immune health! 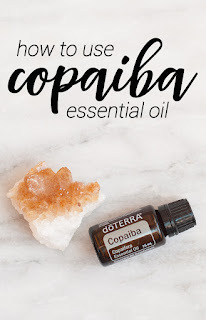 As you know, I use doTERRA essential oils, and their Copaiba oil is a blend of resin from Copaifera reticulata, officinalis, coriacea, and langsdorffii. 1. Liver support - rub one drop over liver each day. 2. Maintain Healthy Blood Pressure - Place 1 drop under the tongue each day, or put 1 drop in a veggie capsule and swallow with water and/or rub 1 drop on the spine daily. 3. Immune and Thyroid Support - Place 1 drop of Copiaba and 1 drop of Frankincense under the tongue each day and/or rub 1 drop of each on the spine daily. 4. Digestive System - Rub 1 drop of Copaiba and 1 drop of Peppermint over the stomach or lower abdomen. 5. To Calm the Nervous System - Rub 1 drop Copaiba on the spine each day. 6. Inflammation - Place 1 drop Copaiba under the tongue each day, or put 1 drop in a veggie capsule and swallow with water and/or rub 1 drop on the spine daily. 7. For Occasional Intense Headaches - Place 1 drop of Copaiba and 1 drop of Frankincense under the tongue and rub 1 drop of each on the area of the head that hurts.